Now I'm no expert when it comes to blogging, but this post has been highly requested! 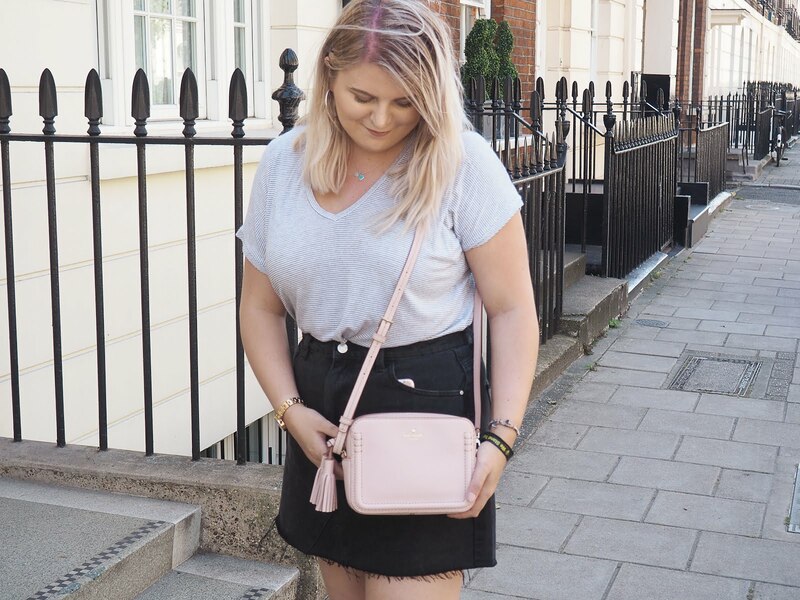 As I've worked with my fair share of brands in the 15 (roughly) months I've been in the blogosphere, I know just how nerve wracking it can be when it comes to emailing brands... So I wanted to break it down for you and create a short guide on how exactly to do it! 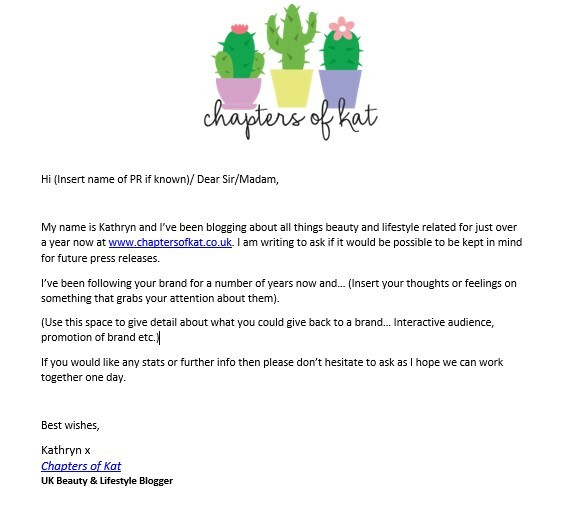 Disclaimer: I am not claiming to know the ins and outs of everything there is to know about blogger collaborations, this post will consist of simply what's worked for me and my basic knowledge on PRs. Before you get working on your emails, it's important to choose the brands you'd like to work with. It could be a brand you've loved/used for months, or one that you've seen pop up recently and would love to promote. But remember, whilst freebies are all well and good, don't go in with that in mind. Working with brands is a two way street and has to be beneficial for both parties to be successful. What do you know about the brand? Are you genuinely interested in what they have to offer? Do they fit your niche? Could you see yourself devoting time to them if you weren't a blogger? Possibly the trickiest part is hunting down that darn press email. Most brands have them readily available on their website but if you're struggling to find one then you could either contact them via social media (e.g. "Hi, I was just wondering if there was a PR email I could contact you on?") or send a quick email to their general enquiries with a subject along the lines of "blog collaborations". Another thing to take into consideration is obviously, a brand isn't expecting you to have their entire business history down to T... But a bit of background in your introductory email to show what you like about them really helps. And now... You wait! One of the main reasons bloggers (particularly new bloggers) are put off from contacting brands is the fear of rejection but honestly, the worst that can happen is they either ignore you or say no. If they give you negative feedback, don't take it to heart... Move on from it and your confidence will grow, trust me on that one. Another misconception when it comes to blogging is that numbers are everything. Well nah, they really aren't all that. Sure, the global companies are probably after the influencers with the large followings, but it's all about interaction. Keep your social media fairly clean (but don't become a robot), interact lots and stay active! Emailing a brand isn't the be all and end all to blogging, there are other ways to getting brand collaborations. All you need is Facebook! I'd highly suggest joining the UK Blogger Opportunities group as I've had some really great responses from it (i.e, my Tiger collab). Alternatively, you could reach out to independent brands that you've discovered on Twitter or Instagram which I personally love doing. This allows you to build a relationship with the owner and actually learn about the products which I always find super interesting, geek at heart and all that. 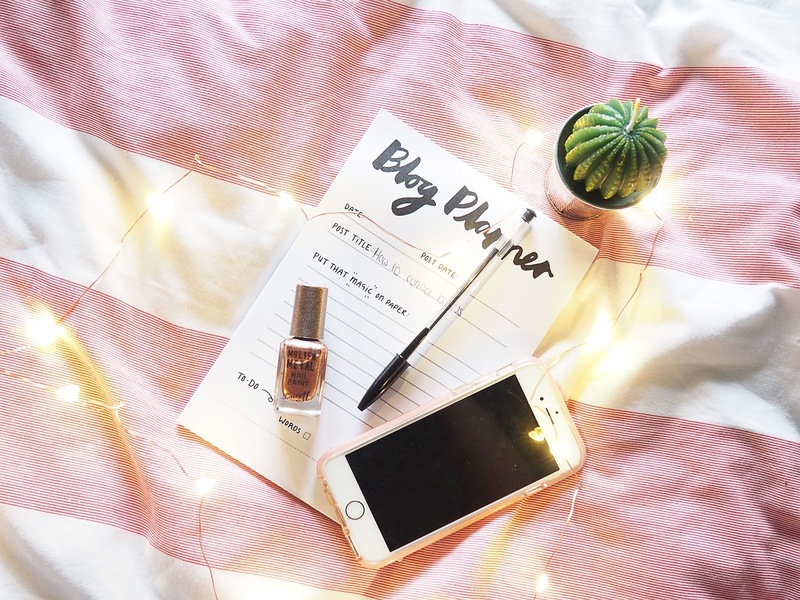 I hope this was somewhat helpful for those of you who haven't got into the collaborating side of blogging yet, and hopefully you've taken something from it. If you get a response then YAY - I'm super proud of you... And even if you don't get a response the first time, I'm still proud of you. It's terrifying I know, but you'll be so happy when you secure your first brand collab. If you're fairly new to contacting brands, would you consider doing so now? This is so helpful Kat! I've never actually contacted brands because I don't think my stats are all that good, but you're right... the worst that can happen is that they say no. This is incredibly helpful! Thanks for sharing! I know you say in your title that this is the "not so informative guide" but honestly it's really great! This was exactly what I've needed to read as I get so nervous about contacting brands and end up hoping that they will contact me (note: they don't!). I am totally saving this post though for reference when I work up the nerve to contact some brands later in the week! Fab advice!! I've been blogging for a year and a half and not yet contacted any brands I'm still plucking up the courage. This is such a great post and I feel really motivated to get cracking!! I've contacted brands in the past (hey it worked with Filofax!) but I haven't really done it this year... This is a really helpful post - especially the email! Thank you so much for this post! I would love to work with a few brands but never knew how to go about doing it! This post is definitely going to help when it comes to contacting some brands in the future. KAT THIS IS AMAZING I LOVE IT! Thank you so much! Thabks for posting this, I found it super useful and I'm going to take on board your tips when I eventually feel the time is right to connect with brands. Thank you, this was really helpful! I´m always scared of rejection, so this is definitely a thing I should work on more. I´m also definitely saving that draft for an email. It´s so much easier working off a rough draft than coming up with everything yourself! So well done for making it easier! Such a fantastic guide Kat. Their's some really great tips here, that will help a lot of people including myself. Brilliant blog post. This has been so helpful since I am thinking about trying to contact some brands, so thank you so much for sharing this! This is very, very useful! You're absolutely right: the reason so few of us make the first move is definitely fear of being rejected, or confirmation of our fear that we're not 'good enough' for whatever reason. And yes - I would absolutely consider contacting a brand after reading this, so thank you very much!